You may want to get out a cookie cutter to make perfectly round layers for these Mini Cracker Sandwiches. Spread crackers with dressing. Cut 3 small circles from each of the Singles and bologna slices to fit onto crackers. 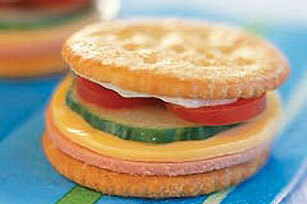 Fill crackers with 1 Singles circle, 1 bologna circle and remaining ingredients to make 6 sandwiches. Use small cookie cutters to cut the Singles into shapes, such as hearts or stars, instead of the circles.